Head shape: Wide, semi-circular head. 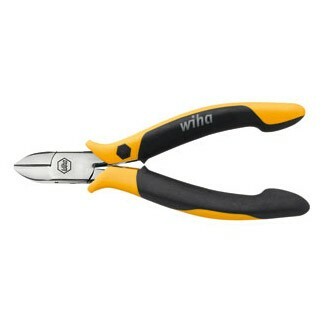 Design: Bevelled cutting edges, also appropriate for thin, hard wires. Maximum service life of cutting edge achieved through additional inductive hardening to approx. 64 HRC. With opening spring. Surface resistance 10^6 - 10^9 ohms. Application: All round electronic diagonal cutter for cutting wires of different hardnesses.